A male 48 years old referred to us from another town. He sustained T-shape fracture of the distal femur (a car accident) in Sep. 2003, fixed by DCS somewhere else. The wound had some problems and healed completely to Dec. 2003. Since Jan 2004 started to bear wight with crutches, marked appearance of deformation. Now clearly some mobility is present, though the plate and screws look not broken. Knee ROM is 90 degrees. Your opinion about how to manage the case would be greatly appreciated. The radiographs show an apex lateral (varus) deformity (about 10 degrees) at the distal femoral metaphysis fracture site with a bent plate. The fractures are only partly healed. The joint surface appears congruous. Please expand upon your observation of "marked appearance of deformation". What deformity and how much? A lot of varus? Other? "clearly some mobility" Is there motion at the fracture site to manual stress? Other? Is the deformity new or progressive or was this fixed in this position? If there is gross motion at the fracture site and gross clinical varus deformity then I would suggest removal of the loose/bent plate and restabilization with (order of preference) a locking plate, retrograde IM nail,a blade plate, a new DCS, ring XF, endosteal subsitution plate. I would add autologous cancellous bone graft. Other treatment options include bone graft substitutes (synthetic bone grafts, BMP etc) cortical allograft, stimulation (electrical, ultrasound shock wave), medial plating, quadricepsplasty. >Please expand upon your observation of "marked appearance of deformation". What deformity and how much? A lot of varus? Other? As he remember he marked some varus increasing day to day since he started partial WB in Jan 2004. He's been on two crutches to date. Exactly.There is mediolateral mobility about 15 degrees. >Is the deformity new or progressive or was this fixed in this position? The deformity is 4-6 months old. It can be increased manually or corrected except posterior translation of the condyles. I have the same starting point. I think Xf would be useful for gradual deformity correction anyway. How about antegrade closed nailing after length/axis correction by XF? XF for deformity correction followed by antegrade nail would be ok although neither element would bemy first choice. 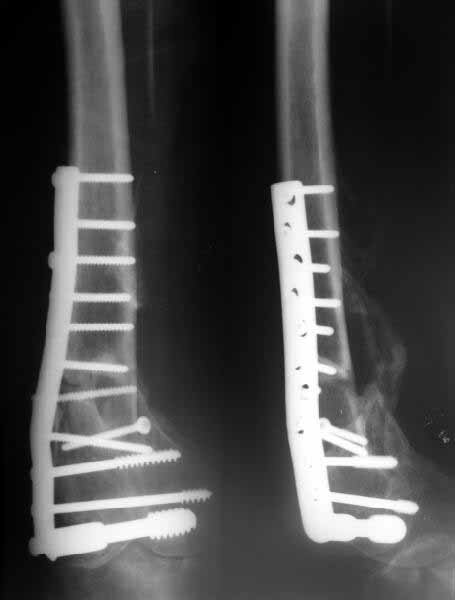 The XF for deformity correction is unnecessary as it could be corrected acutely open when the plate was removed. Antegrade nailing will give inferior mechanical stability to the distal fragment than the other options mentioned (IMHO). Endosteal substitution plate is a J Mast concept where a second plate is placed in the medullary canal. (especially useful for failed lateral platings of distal femur fractures). It is illustrated in his book on indirect reduction techniques (Mast JW, Jakob R, Ganz R. Planning and Reduction Technique in Fracture Surgery. Berlin: Springer Verlag; 1989). It may become of historical perspective if locking plates work as well as we all hope. >The XF for deformity correction is unnecessary as it could be corrected acutely open when the plate was removed. To minimize tissue damage we still removed the plate and applied the XF. The plate was not broken neither screws. The condylar screw was pulled out like pencil from cup. After some days of distraction conversion to nail will be discussed. >Antegrade nailing will give inferior mechanical stability to the distal fragment than the other options mentioned (IMHO). Practically no problem wih this aspect. Very interesting. I'll search something on this.